Vancouver, BC – April 26, 2018 - Zinc One Resources Inc. (TSX-V: Z; OTC Markets: ZZZOF; Frankfurt: RH33 – "Zinc One" or the "Company") confirms the discovery of high-grade zinc deposit located in the Mina Chica zone at the Bongara Mine Zinc project located in north-central Peru. 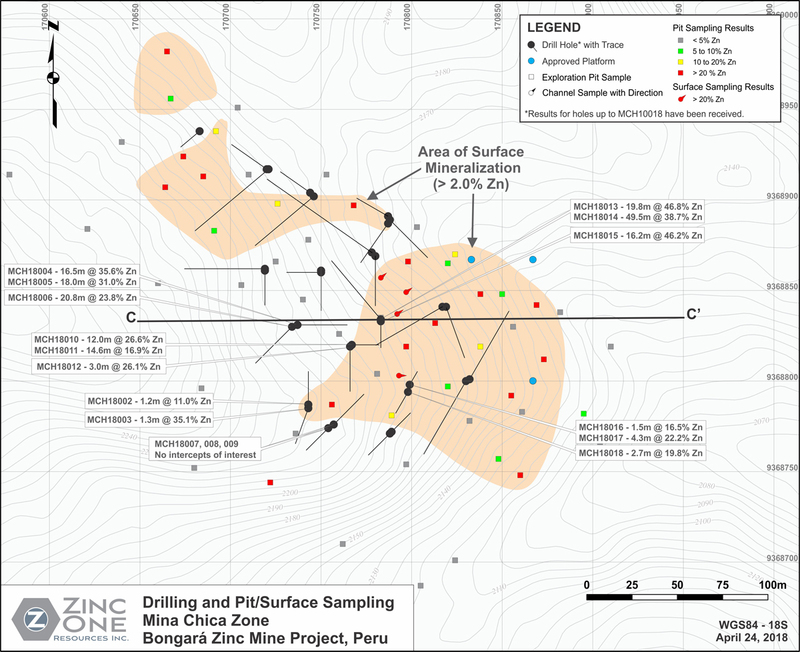 The drilling at Mina Chica is part of the ongoing program that is targeting several areas of known high-grade zinc mineralization. This important discovery is based on additional high-grade results with substantial vertical thicknesses at Mina Chica. It is an exciting new area to be potentially included in the upcoming resource estimate and underlines the potential upward scalability of the Bongará Zinc Mine project. 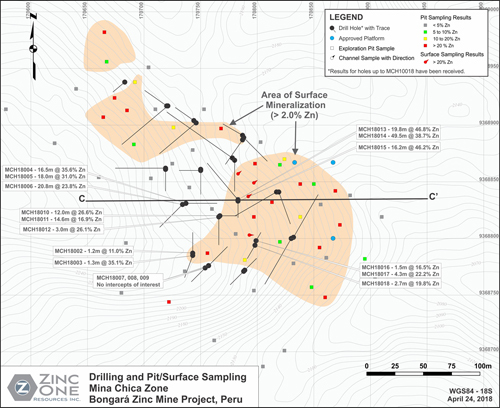 To date, assays for only 18 of 50 holes totaling 2,070 metres drilled at Mina Chica have been reported. The data for the remaining 32 holes will be announced once assays results have been received, checked, and compiled. Bill Williams, COO of Zinc One commented, "The confirmation of the discovery of a new high-grade zinc deposit at Mina Chica marks an exciting turn of events for the Bongará Zinc Mine project. Our drilling results have clearly demonstrated that the high-grade zinc mineralization forms a contiguous body, whose vertical thickness is beyond our previous expectations. Furthermore, zinc mineralization has been encountered in nearly every hole drilled to date and we look forward to reporting the assays from these holes so that the magnitude of the zinc in this deposit can be properly quantified. 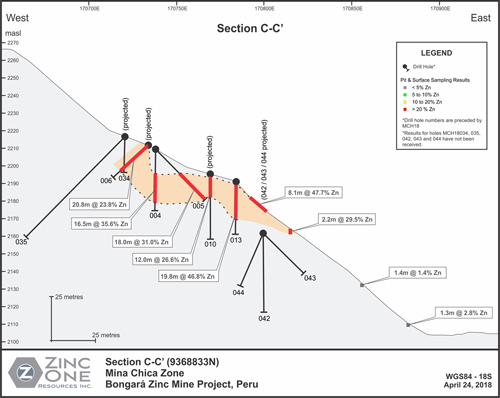 Overall, some of our drilling has only partially delineated this zinc deposit and thus it remains open in certain directions. We look forward to the prospect of building a potentially more significant project than originally contemplated. It appears that Mina Chica may not be so small after all." Jim Walchuck, President and CEO of Zinc One commented, "Congratulations are certainly in order for our COO, Bill Williams, and his geologic team on this discovery. The new results at Mina Chica combined with the previously announced results are substantially adding to our expectations for the potential upscaling of this extremely high-grade zinc deposit. Bill and his team deserve full credit for this incredible and extraordinary event in Zinc One history. This is truly a turning point for Zinc One and we are looking forward to receiving further drill results." The sample from each core run is placed in a 60-centimetre long, plastic core box that has five columns. Core recovery, rock quality designation ("RQD"), and geologic features are logged and sample intervals, which are generally < 2 metres, are chosen. Each core box is photographed and then sampled with a spatula (soil and heavily-weathered rock) or cut with a core saw, 50% of which is placed in a sample bag and stored on site in a secure location. The Company independently inserts certified control standards, blanks, and duplicates, all of which comprise at least 20% of the sample batch, to monitor sample preparation and analytical quality. The samples are stored in a secure area until such time they are shipped to ALS laboratory in Lima (ISO 9001 Certified) for preparation and assay. At the laboratory, samples are dried, crushed, pulverized and then a four-acid digestion is applied. This is followed by the ICP-AES analytical technique for 33 elements, including lead. The same method is used to assay zinc for values up to 20%. If zinc exceeds 20%, it is then analyzed using a titration method. The laboratory also inserts blanks and standards as well as including duplicate analyses.